An oldie from a Scottish band called “Travis“. This song “Why Does It Always Rain On Me“, released in 2006, but only hit my personal world today. Shame on me. Another nugget that presented itself in those dreary 20 minutes between work and home. 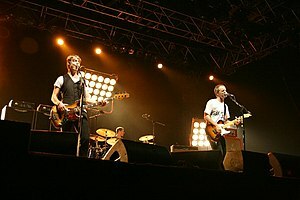 The band is from Glasgow and they formed way back in 1990. The host on CBC2 told a story about the band, in that it rains when they play this live and outdoors. Interesting. Enjoy a very nice tune. This entry was posted in Rock and tagged Music, Travis, Why Does It Always Rain on Me. Bookmark the permalink.